July 27, 2010 - Colton Harris-Moore dubbed the 'Barefoot Bandit' was arrested in the pre dawn hours of Sunday when police picked up his trail on the island of Eleuthera in the Bahamas after they spotted the 44 foot long power boat in which the bandit had stolen from a marina in Marsh Harbor, Great Abaco Island. Colton Harris-Moore, dubbed the ?Barefoot Burglar? for the reason that he once kicked off his shoes to flee police chasing him in the woods of his home town Camano Island, Washington has been on a two year spree of breaking into homes, stealing, cars, boats and aircraft since his escape from a group detention center in 2008. 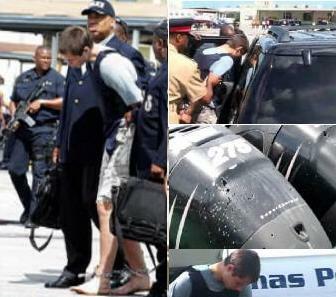 The 19 year old Colton Harris-Moore had been wanted for crimes committed across the U.S., Canada and now the Bahamas. Over the July 4th weekend, Colton Harris-Moore Moore stole a single engine Cessna Corvalis 400, from Monroe County Airport Bloomington, Indiana and crash landed in shallow waters off Great Abaco Island in the Bahamas. The bandit soon began his break-in spree of local Bahamian businesses. At that time the bandit was placed on the FBI?s wanted list and a $10,000 reward was issued for his arrest. The Bahamian government warned its citizens of Colton Harris-Moore and considered him to be armed and dangerous. On Tuesday the bandit stole a 44 foot long cruiser powerboat from Marsh Harbor were he was s caught on surveillance cameras at the marina about 4 AM next to Curly Tails restaurant at the marina. Colton Harris-Moore was apprehended on Sunday at approximately 3:30 this morning by the Royal Bahamas Police Force after a short boat-chase near Harbor Island. The Bahaman police spotted the 44 foot boat and shot at both engines disabling the boat. At that time the ?Barefoot Burglar? threw overboard his laptop, cell phone (iphone) and other personal belongings. He then put a gun up to his head and threatened to commit suicide. The police was able to talk Colton Harris-Moore out of causing any further harm and was taken into custody. 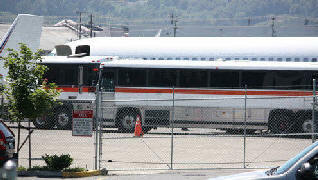 Colton Harris-Moore was flown to Nassau the capital of the Bahamas, where he will appear in court Tuesday. Colton Harris-Moore will be charged with illegal weapons possession and other crimes committed in the Bahamas following his weeklong run from Bahamian authorities. Charges by the Bahamian government it expected to be present in Bahamian court on Tuesday since Monday is a holiday. The charges to be filed by the Bahamian government will take precedent over those of the United States. On Tuesday (July 13, 2010), Colton Harris-Moore had plead guilty in a Nassau court in the Bahamas of illegal entry into that country. The Bahamian court sentenced the 'Barefoot Bandit' to three months behind bars or a $300 fine. The U.S. Embassy paid the fine and then the "Barefoot Bandit" was placed on a commercial flight and arrived at Miami International Airport just after 6 PM (July 13, 2010). The FBI took him off the plane and put him into a waiting car. On Wednesday the "Barefoot Bandit" will appear in Miami?s federal court and then whisked off to Seattle. At Miami's Federal Court, Colton Harris-Moore will face an identity hearing. The A prosecutor will confirm Colton Harris-Moore identity to the court at which time he will then placed in the U.S. Marshals custody and flown to Seattle, Washington where he will be tried on numerous crimes in Seattle's U.S. District Court. On Wednesday (July 14, 2010) Colton Harris-Moore was before Miami's U.S. Federal Court Magistrate Robert Dub?. At that hearing, when asked if he had an attorney, Colton Harris-Moore told Judge Dub? that his mother had hired an attorney in Washington. At which time Judge Dub? postponed his removal and bond hearing in order that his attorney or a public defender could represent him. The next court date is set for Friday. On July 21, 2010, Colton Harris-Moore arrived in Seattle shortly after 1 p.m. Pacific time. Harris-Moore was transferred from Miami to Seattle that morning by U.S. Marshals aboard a Justice Prisoner and Alien Transportation System aircraft MD-80 (Conair). Upon arrival in Seattle, Harris-Moore was turned over to authorities with the SeaTac Federal Detention Center. Harris-Moore, who is the subject of an arrest warrant issued by the United States District Court, Western District of Washington, for the interstate transportation of a stolen aircraft, is also wanted by the Island County, Washington; San Juan County, Washington; and Monroe County, Nebraska authorities. According to Assistant Special Agent in Charge Steven Dean of the Seattle FBI, "It was great police work by the Royal Bahamas Police Force and timely and crucial sharing of information by the police departments in Washington, Idaho, Nebraska, and Indiana that led to Harris-Moore's apprehension." Colton Harris-Moore, better known as Colt, was born on March 22, 1991. He is 19 years of age, stands 6?5? and weighs 210 pounds. The bandit grew up in a mobile home in an isolated area of Camano Island located in the state of Washington. There he was a rein of criminal terror on the citizens of Camano. Colton Harris-Moore was arrested in 2007 and sentenced 3 years in a juvenile detention center. However, Colton was later transferred to a halfway house because of good behavior. In 2008, while serving time in the halfway home, Colton escaped out a second story window and has been on the run ever since. Colton Harris-Moore is not a licensed pilot. The only flight training that Colton Harris-Moore has received is from a flight manual he ordered online and using a personal computer based flight simulator. However, he is responsible for the thief of several aircraft. In February 2010 it was believed that Colton Harris-Moore was responsible for stealing a Cirrus SR22 aircraft in which the aircraft appeared on radar at 11:30 PM skirting the restricted airspace set up for the Vancouver Winter Olympics 210. In September 29, 2009, a Cessna 182-T airplane, registration N2183P, was stolen in Ohio. The airplane was located two days later in Granite Falls, Washington. The aircraft had been flown and landed with sustained substantial damage to the fuselage. Colton Harris-Moore comes from a dysfunctional home, it has been reported that that at age two his biological father left the home and at age 7 his stepfather died. It was reported the stepfather was physically and emotional abusive and on one occasion his stepfather choked him during an argument at a family barbecue. Colton Harris-Moore had great difficulties in the public school setting; he would not listen to his teachers and was involved in numerous altercations at school. Colton Harris-Moore has been turned into folklore through out the country. You can find T-shirts bearing his face and or the words "Fly, Colton, fly" and "Momma Tried" selling on the internet and local stores. Colton?s story can be found on the internet at such places as Youtube and Facebook, with a huge fan club throughout the United States and worldwide. Colton has over 60,000 followers on Facebook . There are many who had cheered this fugitive on. Colton Harris-Moore's mother Pam Kohler in a news media interview she stated, "I hope to hell he stole those airplanes, I'd would be so proud, I want him to wear a parachute next time." Pam Kohler has hired a Seattle attorney to handle her "entertainment" interests. She said a book is in the works detailing the life and times of her 19-year-old son.